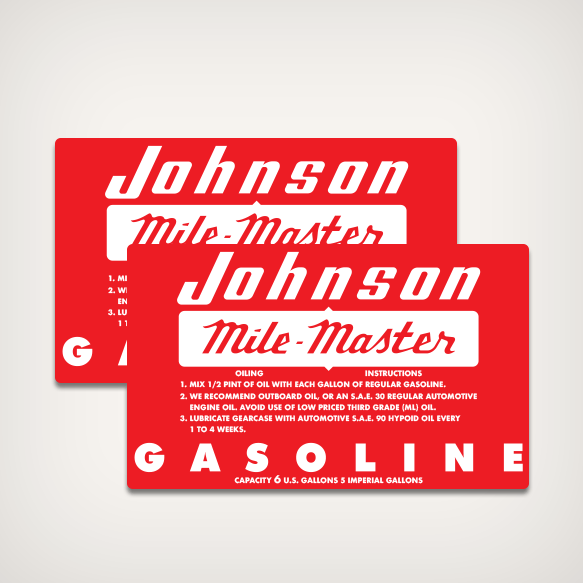 Johnson Mile Master 6 U.S Gallons Fuel Tank decal replica Sold by set for 1956 Gas Tanks. 1. MIX 1/2 PINT OF OIL WITH EACH GALLON OF REGULAR GASOLINE. 2. WE RECOMMEND OUTBOARD OIL, OR AN S.A.E. 30 REGULAR AUTOMOTIVE ENGINE OIL. AVOID USE OF LOW PRICED THIRD GRADE (ML) OIL.